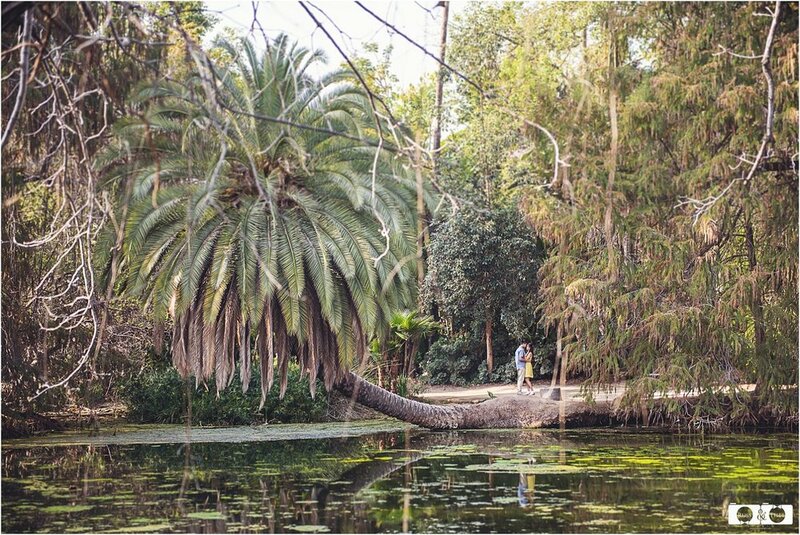 We absolutely love Los Angeles Arboretum and were lucky enough to shoot here for Dylan and Rianna’s engagement shoot. Here is a vast Oasis of beauty, tranquility and nature at its best. The location is really diverse in terms of looks in photography. There are unique spots throughout the acreage that really provide a photographer like us an opportunity to get creative. We planned their engagement shoot and were thrilled to get a gorgeous sunny day. We like this to be relaxed, fun and no stress. We wander and chat. There’s no pressure to do anything or to be something that you are not. As a photographer, Thet and I, usually take the lead from how they are as a couple. Dylan and Rianna were a little nervous to start, but soon got into the swing of it and enjoyed cuddling and spending time together. The grandeur of capturing the early evening light was never disappointing. Their love for each other is full of passion and respect. They are clearly a great match. The photographs will tell it all. We feel the good chemistry between them in those moments so we did not want to move them from that good energy. Dylan and Rianna are young lovers who have stood the test of time. It’s very obvious that their love for each other runs deeper that mere infatuation. Spending time with them is very easy and very lovely. They are comfortable in each other’s company and clearly perfect together. It was lovely spending our photo shoot. We wandered enjoying the session, chatted loads about their wedding plans and what they are looking forward to with the big celebrations coming up. We are all very excited about the fact the next time we could catch up would be on the wedding day! Thet and I can’t wait to shoot their special day!